After Hong Kong, the plan was to head back to the UK to see family. However, this got delayed for a week because a week on the beach in Thailand was too enticing. And it would have cost the same to fly from Hong Kong to the UK as it would to stay in Phuket for a week and then fly back to the UK. This is part of the advantage of flexibility in these situations. For our last week in Asia, and given the savings, we booked into a nice hotel in Phuket. For the modest sum of $30USD per night we were treated to a room about four times the size of our shoebox in Hong Kong, along with some nice-to-have’s such as a walk in rain shower, full sized bathtub and balcony overlooking the pool. True luxury after some of the places we had stayed! Add to this a 10-minute walk to the beach and, for me, a small gym it was all turning out to be a great decision. Lou was keen to try some Thai food and get me acquainted with the local cuisine. Thai food follows similar patterns to that of Vietnam, simple fresh local produce that is well combined with spices and citrus fruit flavours. On that note, we used the week to get around the area and try some food including, traditional Pad Thai and Lou’s favourite – street food vendors making banana Nutella crepes! Now I didn’t think that was local cuisine but Lou continued to try and convince me otherwise as we made repeated visits for desserts after dinner. This guy had a spike in business during Lou’s visit! Phuket is a very touristy place. Had we not booked such a nice hotel, we might not have enjoyed our week there quite as much. It’s become overpriced by Asian standards and many vendors are out to make the extra dollar from visitors. And, like some of the Vietnamese cities we visited, the Russians are taking over, with many of them lining the beach in their weird, speedo-clad, sun worshipping positions. I wouldn’t recommend Phuket as a place to disconnect and experience the real Thailand. To keep up with our tradition of taking boat tours, we decided to investigate our options. 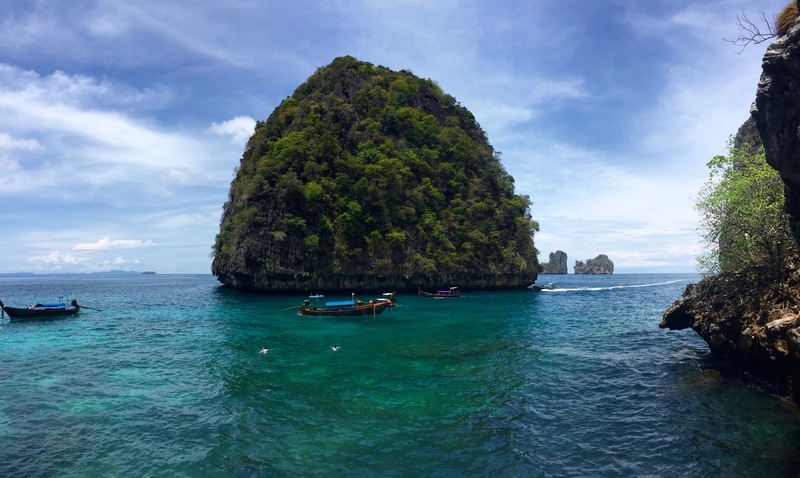 Phuket has quite a few – visitors can head out to Phang Nga Bay, the site of filming for James Bond’s “The Man with the Golden Gun”, or they can opt for Koh Phi Phi Leh island (part of the Phi Phi islands), used for the Leonardo Di Caprio movie “The Beach”. With a strong track record of persuading Lou where to go based on film locations, I knew I could tick off the iconic James Bond scenery from my list of great movie sets. After all, Vietnam was based on Top Gear and I spent too much time in Hong Kong looking at scenery from the Dark Knight. With my tail between my legs, we boarded the boat for Koh Phi Phi Leh alongside ten to fifteen other couples whose dominant female had worshiped the good looks of Di Caprio as a teenager. Whilst on the boat I was reminded of Lou’s homework for this trip – watch “The Beach”. The 2000 released movie looks somewhat dated but it wasn’t terrible. And I got my first glimpse of our destination for the day amongst a couple of other stops. So, what effect does a movie, released 16-years prior, do to the popularity of a remote island? The beach was crammed full of boats! Tourists everywhere. Not remote. Not tranquil. Full of selfie sticks, bad poses and churned up sand. That’s not to say the view away from the tourists isn’t beautiful, it really is. It just gets quickly ruined with the din of people and boats crowding onto the shore. Koh Phi Phi Leh has a similar feel to El Nido in the Philippines – it’s a stunning landscape that is just too busy as a result of people. People like us. The week of pampering came to a quick and abrupt conclusion with the 3am wake-up call for our flight back to London Stansted. The 12-hour flight with Eurowings would make a short stop in Cologne, Germany before heading back to the UK. It was going to be a long day. It became even longer when we realised that, despite a brand new Airbus for the journey, Eurowings would not be providing any hospitality without trying to charge for it. Use of your TV, a blanket, and even a sandwich were all chargeable in the view of Eurowings – I found it hard to believe there isn’t some airline directive that makes this illegal for such a long flight duration. Sometimes you can get a bargain on your flight costs, just be aware of the potential consequences – $9USD for a crappy sandwich is a painful reminder. All of this was made worse by the storm that we flew into upon takeoff. By the time the turbulence had settled down I was a complete bag of nerves that couldn’t sleep and didn’t want to pay $12USD for a movie on a 6-inch screen. England here we come!